John “Jack” Laiho recently completed his first year as a member of the Syracuse University faculty, and what better way to celebrate than by receiving a National Science Foundation (NSF) grant to support his cutting-edge research. 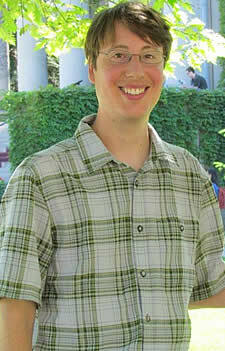 Laiho, who earned a Ph.D. from Princeton University, joined the College of Arts and Sciences’ Department of Physics in 2013. Since then, his research has focused on precision studies of the interactions of quarks via the strong and weak nuclear forces. As a result of Laiho’s hard work and dedication to his research, he will receive an infusion of resources in the form of a $141,200 grant. Laiho, a frequent publisher in academic and science journals, says he will use the grant to develop precision calculations of particle properties using lattice quantum chromodynamics methods. This research allows Laiho to compare the theoretical predictions of the Standard Model of Particle Physics with experimental results, thus shedding light on the laws of nature. According to Laiho, this research could ultimately reveal what many believe to be true: that there is physics not accounted for within the Standard Model.